During any visit we will run a quality check on your water and inquire about any complaints, stains, or sediments. More often than not there is room for improvement, and we do our best to make recommendations based on necessity versus novelty. In most cases the customer already knows they have an issue and are delighted to know that we have been formally trained and can offer inexpensive resolutions to their issues. RockWater Well is a Certified Water Treatment Systems company serving Charlotte, Lake Norman and surrounding areas. Please Visit Our Water Treatment Systems Website. 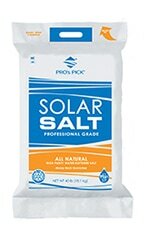 Authorized Dealer for Cargill Pro's Pick Water Softener Solar Salt and other quality Cargill Water Softener products. Residential & Commercial Water Filtration Treatment Systems. Chlorine, Chloramine, or something else? Add a water treatment system to remove odors, bad tastes, contaminants. Call or Email Us Today!